THE men’s World Squash Team Championship, due to begin in Egypt in 12 days time, is in chaos after five teams, including current champions England, decided to withdraw because of security fears. However, the event will still go ahead following a robust statement by the World Squash Federation today who were clearly not happy about the withdrawals. The unilateral decision by England, France, Germany, USA and Canada was met by stiff words from the WSF. Their statement from Chief Executive Andrew Shelley read: “This morning a few nations have banded together and withdrawn from the WSF Men’s World Team Championship due to their unease about travelling to participate in the event in Cairo. “This is both disappointing and a little difficult to understand as there has been no security threat there, unlike for the people of other nations tragically targeted by extremists. “Cairo is a city where it is ‘business as usual’, though to add reassurance for nations, a full range of protection measures are in place managed by the Egyptian Government, as reported to participating nations. “The Championship is proceeding and the Egyptian Squash Federation have a great welcome in place for participating teams and look forward to seeing you there next week. Squash Mad first revealed the news on November 22, and updated events yesterday, with reports that several nations were unsure about sending squads to Cairo because of security issues following the terrorist attacks in Paris which resulted in the deaths of 130 people. Officials from England Squash were in contact with other nations and the decision to pull out was made overnight…only hours after the tournament released its own press announcement publishing the official seedings for the event. It was first believed that Australia were one of the teams to withdraw but CEO Richard Vaughan this afternoon explained that a decision had yet to be taken. Keir Worth, England Squash CEO, confirmed the SquashMad exclusive story, commenting: “Following the release of security plans for the event and subsequently a comprehensive report from independent security advisers, we have concluded that there is an inherent risk that has not been mitigated to an acceptable level. England’s four-man squad of Nick Matthew, James Willstrop, Daryl Selby and Chris Simpson reached the decision to pull out of the Championships unanimously. Team England captain Matthew added: “The England Team are incredibly disappointed not to be taking part in Cairo. The World Team Championships is one of the most prestigious events in squash and has provided many highlights in our careers. 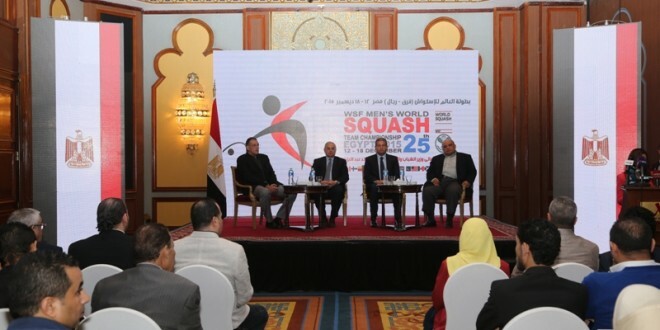 Update from US Squash: US Squash has informed the World Squash Federation (WSF) today that it will withdraw from the 2015 World Men’s Team Championship scheduled to begin December 12 in Cairo, Egypt. Notice was provided in a letter from England Squash noting that the U.S. as well as defending champions England, along with Canada, Germany and France would all withdraw due to security concerns. In the letter, WSF was urged to re-schedule and re-locate the event. Originally planned for Kuwait, the event was quickly relocated to Egypt several weeks ago after the International Olympic Committee (IOC) suspended the Kuwait national Olympic committee for the second time in five years. The WSF in turn suspended the Kuwait Squash Federation, and sought a new host for the upcoming event. Only days after the announcement to relocate to Egypt, the Russian commercial jet departing Sharm el-Sheikh was bombed, and soon after, the terrorist attacks in Beirut, Paris and Bamako, Mali took place. Last week, the U.S. State Department issued an unusual worldwide travel alert for U.S. citizens through February 2016 due to possible risks and increased terrorist threats. Earlier this year, WSF re-located the 2015 World Junior Championships from Egypt to Holland due to travel concerns expressed by many of the participating countries. While the Egyptian government and the state tourism industry are keen to promote Cairo as a safe destination, and major squash events have been successfully staged in Cairo and El Gouna in the past year, visiting nations have been appraised of fluctuating safety levels by their security advisers. Those assurances did little to allay the fears of players who informed their governing bodies of their reservations. The decision to withdraw appears to be the sensible option, although one not shared by the WSF. Egypt,  England,  France,  Australia,  Hong Kong China,  Germany,  India,  Scotland,  South Africa,  New Zealand,  Mexico,  Pakistan,  Malaysia,  USA,  Switzerland,  Finland,  Canada,  Argentina,  Colombia,  Austria,  Qatar,  Republic of Korea and  Iraq. It is the second major blow for squash in 24 hours following yesterday’s news that the Women’s World individual Championships in Malaysia looks set to be cancelled. SquashMad broke that story HERE and today Malaysia Sports Minister Khairy Jamaluddin called on the event’s promoters to reveal the real reason for postponing the tournament. The promoters, Hallmark Events Group, cited security concerns in postponing the world meet, scheduled for December 11-18 at the National Squash Centre, Bukit Jalil and KLCC. The Professional Squash Association (PSA) in a statement on Tuesday, confirmed that they are looking into the alleged security concerns and have appointed an independent consultant to conduct a review of the situation. The PSA also expects to receive a risk assessment report by the end of the week before making their final decision on the matter. However, Jamaluddin believes that Hallmark should just come clean. “We just hosted world leaders in KL. Should come clean about so-called security concerns or reveal real reason,” Jamaluddin said in a Twitter posting reported by the Malaysian Star. He was referring to the 27th Asean Summit that was held in KL from Nov 18-22, that featured several world leaders including US president Barack Obama and Japan Prime Minister Shinzo Abe. On social media, speculation is rife that the cancellation was due to Hallmark’s inability to secure sponsors. As Squash Mad pointed out yesterday, there were no media releases to announce sponsors, no confirmation of a venue for the glass-court, or any news of ticketing and hospitality packages.